The DIN 65151 standard, which has been used by the fastener industry for over 20 years, has been superseded by the new DIN 25201-4 B. 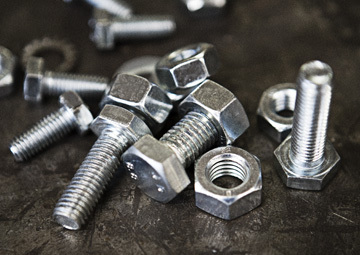 It has introduced tough new test criteria that must be adopted by fastener manufacturers. Specifies the test equipment to be used, such as a Junker Test Bench (as it was with DIN 65151). DIN 25201-4 B requires that one reference test on an unsecured bolted joint must be performed to discover the effective displacement at which the bolted joint fully loses its preload after 300 load cycles, ±100 load cycles. Once the effective displacement has been discovered by the initial reference test, three subsequent reference tests must be performed to ensure that the effective displacement is correct. The next stage of the test process requires twelve verification tests to assess the effect of the securing element. The same effective displacement determined by the reference test must be used. The securing element is considered to be adequate if the preload that remains after 2,000 load cycles is more than 80% of the initial preload. Finally, DIN 25201-4 B requires that a comprehensive test report must be prepared, detailing the exact processes and results. Vibrationmaster’s J121 and J600 Junker Test Benches have been specifically designed to accommodate the requirements of the new DIN 25201-4 B. Our unique Variator, closed-loop system and computer control allow you to set your test regime criteria to meet the exact needs of the reference test and to recreate exactly the reference test criteria when you complete the verification tests. A commented version of DIN 25201-4 B is available from our downloads page.